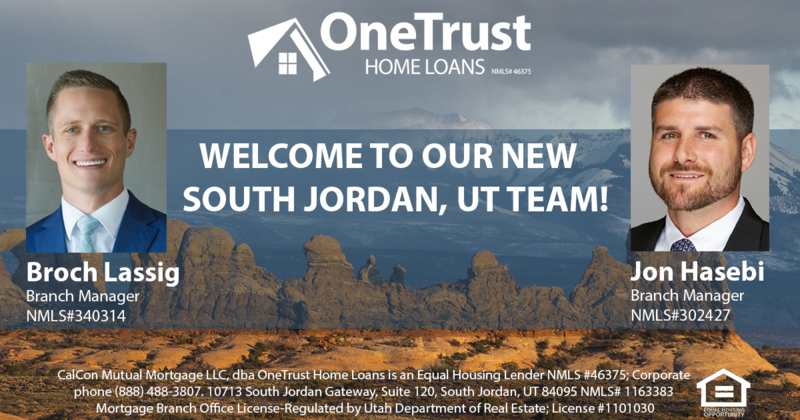 OneTrust Home Loans, a leading mortgage lender headquartered in sunny San Diego, CA is proud to announce a new Utah location dedicated to servicing the Beehive State in South Jordan. The teams are led by their respective branch managers, Broch Lassig and Jon Hasebi. As a full-service, direct lender and servicer, OneTrust Home Loans is excited to bring Broch, Jon, and their teams aboard. Broch Lassig began his career in the mortgage industry in 2009 and has since been recognized as a top producer in the industry and was ranked among the top 1% originators in the nation in 2017. Lassig is also regarded among an elite group of industry professionals, along with OneTrust CEO Josh Erskine, as a Housing Wire 2018 Rising Star. Jon Hasebi, a consistent high-volume producer and leader, was also recognized among the top 1% originators in the nation in 2017. With over 15 years of experience, he brings with him a team of loan officers with extensive knowledge of the Utah mortgage space to OneTrust Home Loans. With these two strong leaders combining forces under the OneTrust brand, they will be heading up a branch that is projected to close over $250 million in volume in the coming year, establishing themselves as a major player in the Utah market. Their office offers the standard loan options like Conventional, FHA, VA, USDA, and Jumbo, but also supports a portfolio division that offers appealing financing options for more unique borrowers like those that are self-employed, physicians, attorneys, investors, and more. Additionally, the teams specialize in construction and lot financing for homeowners, and also to support local builders with funding for land acquisition, spec and model homes. Broch and Jon strive to support their local real estate agent community by providing a superior client experience and supporting their businesses with expanded product offerings. They also leverage technology and a fully staffed marketing department to offer additional tools and resources to their real estate agent partners to assist in joint marketing efforts. Both managers focus on maintaining a competitive atmosphere among their originators and promoting a fun and family-oriented culture, keeping the client experience at the root of their efforts. They encourage their teams to continue their education and training in the industry by regularly flying staff to seminars and inviting guest speakers to motivate and coach them.